Secure access via Gira Smart Home app, HomeServer iOS app and Gira security system iOS or Android app. Secure remote access to web-based visualisations. Secure remote maintenance and remote programming of the Gira HomeServer, Gira G1, Gira X1, Gira L1, Gira DCS IP data interface, Gira Alarm Connect security system and Gira KNX IP router. Secure remote programming via the Gira HomeServer experts. Secure remote programming via the Gira Project Assistant (GPA). Secure remote maintenance and remote programming of KNX projects using ETS4 or ETS5. The programming and diagnosis is supported via group and bus monitor. Secure remote access to HTML pages in the smart home network (e.g. camera, NAS, router, switch). Secure data transfer courtesy of SSL/TLS encryption. Portal server is located in Germany and is subject to German laws on data. Independence from internet provider and routers used. Secure remote access even with IPv6 Dual Stack Lite - (e.g. with Unitymedia), LTE, or UMTS connections. Management of access to the secure connections via KNX communication objects, Gira X1 ap, Gira HomeServer app, and QuadClient. Status signalling of the secure connections via KNX communication objects, Gira X1 ap, Gira HomeServer app, and QuadClient. Send notifications via e-mail. An attachment can be added to the email, as an option. Send notifications by text message or voice call via the chargeable, additional service sms77 or MessageBird. Notification triggers can be configured individually (filters, conditions, hysteresis). Supports up to 50 notifications. Optimised KNX IP communication, for mobile or very slow connections. Supports the accelerated transfer of the ETS to KNXnet/IP devices via a direct KNX IP connection. 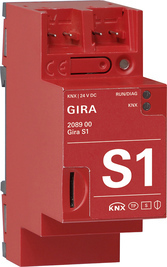 Quick and convenient Gira S1 start-up via the Gira device portal. 2 GB of data each month. Unlimited operating life and 5 years&apos; guaranteed server operation. Firmware update is performed via the Gira Project Assistant (GPA). Hardware prepared for KNX Secure. Future firmware update required. microSD card not included in delivery. To perform the update the Gira Project Assistant V 2.6 is required. PC application for secure access to devices in the remote network.